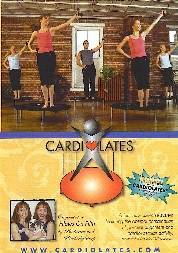 Cardiolates Rebounder DVD by Kimberly and Katherine Corp combines the cardiovascular and health benefits of a rebounder workout, with the core, aligning and strengthening provided by Pilates. This DVD is for you, if you want to keep your body upright and aligned, and increase your core stability by working the postural muscles. The guidelines provided on this rebounding DVD will strengthen the cells of your body in its optimal alignment and help you to move through life with ease and energy. The Cardiolates Rebounder DVD will help you bounce your way into fitness.